Kelly & Natalie came to us through recommendation. They had a very good idea of the menu they wanted, which was a mix of freshly prepared and tasty wedding foods, dips and breads for their informal drinks reception and then plated main and desserts. The feast started with tapas style canapés, with freshly made dips and various breads that guests can enjoy outside, main consisting of a locally sourced lamb dish and was followed by a scrumptious dessert. 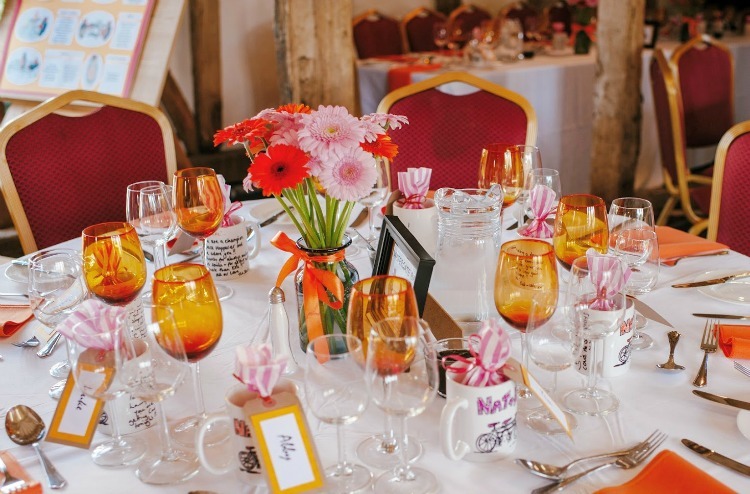 They wanted vibrant colors such as pink and orange and to match their beautiful wedding stationary we offered orange colored water glasses and napkins, Which blended beautifully with their flowers and the furniture in Rumbold’s Farm, their chosen barn wedding venue. Do you need help organising your event or wedding reception? BE Catering is a specialist independent event and wedding caterer in Sussex, Surrey, Kent and London. Our passion is in ensuring that your vision for the special day is made a reality. Contact us now on 01903 501 613 or info@becatering.co.uk for a free consultation and personal quote to discover how we can take care of all aspects of your wedding catering.